Sierra Club Books, 9781578051175, 168pp. The supermarket conundrum Paper or plastic?” sums up a Western consumer society that is on a collision course with the planet’s life-support systems. Do we clearcut forests, process pulp, and bleach it with chlorine to make paper bags? Or do we make a pact with demon hydrocarbon, refining ancient sunlight into handy plastics? About half of America’s municipal solid waste is packagingat least 300 pounds per person each yearand its upstream” costs in energy and resources are even more alarming. 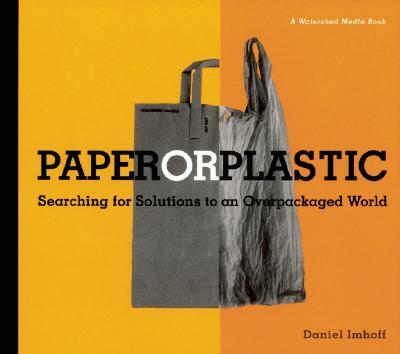 In this fascinating look at the world of packaging, author Daniel Imhoff delves into the life cycles of packaging materials, from wood products to glass, metals, and plastics, and looks at the countless ways that packaged goods shape our culture. Using case studies, the book explores positive trends such as producer responsibility and take back” laws, the eco-design movement, plant-based plastic, labeling to disclose the ecological and social impacts of products, and integrated regional economiesthat is, producing and consuming locally and in bulk. As consumers, there’s much we can do to address the still-growing problem of packaging. Paper or Plastic offers a checklist for action, along with resources for detailed information.